Port Antonio is the “real Jamaica” with its charming markets, street vendors and Georgian architecture in various states of disrepair, its greenery and nearby beaches. There are no Margaritavilles here; just a tangle of backstreets, browsing goats and friendly locals. Jamaican tourism first found purchase in Port Antonio. The island’s major banana port began luring visitors at the turn of the 20th century. Celebrity visitors descended on the town in the 1940s. When the tourist attentions moved on to the west of the island, Port Antonio reverted to bananas. As a gateway to lush Portland parish, its laid-back attitude makes it a perfect destination for travelers seeking to get away from it all. Come visit wonderful Port Antonio! And for other great Jamaica beach destinations, visit our Jamaica Travel Guide. Port Antonio Jamaica enjoys a hot and humid tropical climate all year round, which is exactly what you want for a relaxing vacation. Temperatures range from 66°F to 99°F. Even though they are known for sunshine, they have two rainy seasons a year, from May to June, and September to November. Hurricanes may pass over the island during the months of June to November, so keep an eye on the news. The busiest months for tourism in Port Antonio, Jamaica is January, May and December. Prices for hotels and flights will be most expensive during these months, though you can save if you purchase well in advance. U.S. Citizens traveling to and from Jamaica must present a valid passport when leaving and or re-entering the United States. Residents must present their Alien Resident Card (Green Card) together with passport of country for which they hold citizenship. All visitors are required to travel with a return ticket or onward ticket for entry into Jamaica. This rather appropriately named two-story, 60-room mansion on the peninsula east of East Harbour was built entirely of concrete in pseudo-Grecian style in 1903 by Olivia Tiffany Mitchell, heiress to the Tiffany fortune. It was only lived in for 35 years before being abandoned and given to the government in lieu of unpaid taxes, after which it fell into disrepair. Near the Folly mansion stands the orange candy-striped Folly Point Lighthouse, built in 1888, which overlooks Monkey Island. Set along the eastern outskirts of Port Antonio, Folly Ruins Beach is on the East coast of Jamaica. You should consider stopping by even if you aren’t staying in the immediate vicinity. Folly Ruins Beach stands out from other beaches because it’s perfect for getting away from vacation stresses, like overly crowded restaurants and attractions. 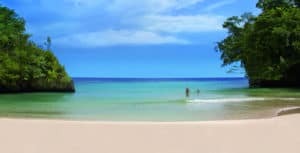 Other nearby beaches in Jamaica offer views of the sea that are just as pretty, but are usually busier because they’re frequented by tourists looking for a lively scene. 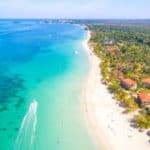 You’ve always wanted to enjoy elaborate, fruit-flavored cocktails on a beautiful tropical beach, so here’s your chance; this beach offers spectacular sand, surf and service. Legend has it that a dragon resides in the bottomless Blue Lagoon, yet still visitors flock to the lagoon each day to experience the breath taking lagoon that was made famous around the world by Jacques Cousteau and Brooke Shields. You won’t find a more beautiful natural watering hole in Jamaica than Blue Lagoon. The waters are indeed a striking hue of blue, and surrounding the lagoon is not powdery sand, but thick forestry. Reach Falls is spectacularly breathtaking! Crystal clear water cascading from tall and river-wide rock face into its naturally made pool, which continues flowing down river, creating more and more playgrounds. It’s fascinating to go ‘behind the falls’ where you are sheltered under a jutting rock section and see the falls from the inside. ExplorerJamaica Tours is unique and separate from all the other companies in Jamaica. Why? They don’t set tour packages and lock-in tours for their visitors. They give the client’s the opportunity to choose and customize their tours. With 24 hours notice you can make changes to your reservation. So what are you waiting for, take the journey. For more information call +1 876-654-1893, or visit them on the web at Explore Jamaica Tours. They offer safe, comfortable diving without the usual complications of a large “cattle boat” operation. 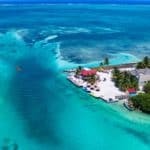 They are fully insured and licensed with the Jamaica Tourist Board, and have a staff of two Master Instructors and an experienced support staff. They also offer Charter Fishing tours along the coast line and out to the Holmes Banks. For more information call +1 876-995-0246, or visit them on the web at Lady G’Diver. 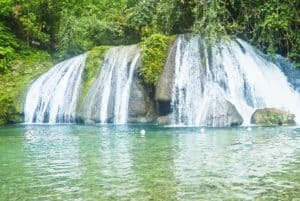 Tropical Video Tours offers private day tours to Port Antonio, Kingston and Ocho rios, Enjoy Rafting on the Rio Grande, Hiking up the World Heritage Blue Mountain and Climbing Cascading Waterfalls including Dunn’s River. They also do customized tours to include anywhere in Jamaica. For more information call +1 876-518-2364, or visit them on the web at Tropical Video Tours. 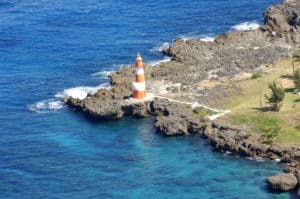 Tour operator located in Portland ,Jamaica offering Private sightseeing and cultural tours for small and large groups around Jamaica. For more information call +1 888-486-5169, or visit them on the web at Peregrine Transport & Tours. Experience Real Jamaica…tour Jamaica with us. We will take you beyond the confines of the resort and show you Jamaica’s hidden gems, introduce you to its culture, its people and their life-style. We will take you diving, swimming, snorkeling, rafting in the balmy waters of Portland. For more information call +1 876 -487-8824, or visit them on the web at Experience Real Jamaica. This place looks like an unassuming beach bar from the front, but is a delightful small restaurant inside, overlooking the sea and with a semi-open kitchen that lets the cooking aromas make you hungry. Nothing you order will disappoint, though we found the coconut curried fish to be a particular winner. Dining here is a real Port Antonio highlight. For more information call +1 876-378-5970, or visit them on the web at Wilkes Seafood. This is a jolly, Italian-run, checked-tablecloth sort of a place, with great pasta dishes, pizza and salads, plus crepes for dessert. Keep an eye on the specials board too, as the chef puts a great twist on local offerings, such as lobster ravioli dressed with avocado. The wine is pretty good too. For more information call +1 876-573-8603, or visit them on the web at The Italian Job. Dickie’s is a tiny pointy-roofed seaside hut on the western outskirts of Port Antonio that offers enormous five-course meals in rooms best described as Bob Marley meets Alice in Wonderland. There’s not always a menu, but trust their suggestion that anything will be delicious. Reservations essential. For more information call +1 876-809-6276, or visit them on TripAdvisor at Dickie’s Best Kept Secret. 993-3053, or visit them on TripAdvisor at Yosch Café. Need seafood? Jerk? An open-air bar? Head to this perennially popular breezy restaurant-bar, overlooking the beach on the southern lip of the bay, which specializes in jerk or barbecued chicken and pork, and groaning plates of conch and lobster. For more information call +1 876-715-6133, or visit them on TripAdvisor at Anna Banana’s Restaurant & Sports Bar. This is Port Antonio’s infamous hang-loose, rough-around-the-edges reggae bar. Young men and women move from partner to partner. You’re fair game for any stranger who wants to try to extract a drink from you. It’s relatively dead midweek when entry is free, but on weekends it hops. For more information call +1-876-844-3298, or visit them on the web at Roof Club. The liveliest spot in Port Antonio, La Best assumes a different identity depending on the evening. Dancehall throbs into the wee hours on Friday; Sunday grooves to a mellow blend of reggae and old-school R&B; ladies’ night is Friday; and periodic live shows occur on Saturday. For more information call +1 876-715-5882. Inside Errol Flynn Marina, this is a good place to spend an afternoon (or evening) away from the pace of the town, at the cabana bar or one of the tables overlooking the bay. Light meals are available. For more information visit them on the web at Marybell’s Pub on the Pier. This place plays vintage ska and reggae on Tuesday and Sunday, but on other nights it’s pretty sleepy. For more information call +1 876-993-3823, or visit them on TripAdvisor at Shadows. While blending all the creature comforts of home, it’s very much a portal into authentic Jamaican culture. Nestled in the heart of the bush, this property’s seven double rooms consist of three deluxe cabins, one suite, and a self-contained three-bedroom villa. Also included are a state of the art Recording Studio, Healing Spa, Swimming Pool (Sanwood only), Gym and Bushbar, forming an exclusive universe within the natural beauty of the grounds. For more information, pricing, or to reserve your room visit Geejam. The Trident’s thirteen oceanfront villas are seductive, cloistered retreats that blend modernist design with an inspired take on 50s and 60s era artwork and décor. Residential in feel, the spacious, airy interiors flow organically between bedroom, bathroom, and living areas, while private terraces with pools complete an environment of clean, conscious and very luxurious living. Each villa is appointed with hand-selected furnishings, accent pieces and original artwork complemented by a contemporary tropical aesthetic. For more information, pricing, or to reserve your room visit Trident Hotel. 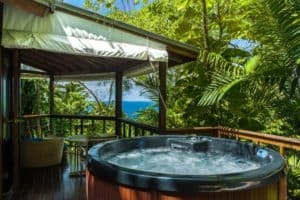 Best eco boutique hotel in Port Antonio, Jamaica. 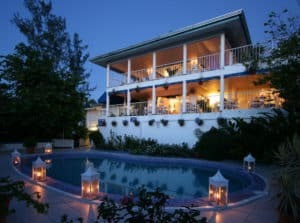 Set on a hilltop on Jamaica’s northeast coast between the majestic Blue Mountains and the Caribbean Sea, Hotel Mockingbird Hill is Jamaica’s foremost ‘green’ hotel minutes from the most romantic Frenchman’s Cove Beach. 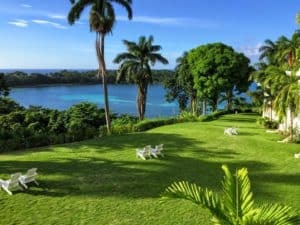 A tranquil, serene, sanctuary with breathtaking vistas, laid back luxury and world class cuisine, Hotel Mockingbird Hill is the ultimate, authentic Jamaican experience. For more information, pricing, or to reserve your room visit Hotel Mocking Bird Hill. Facilities include a swimming pool and two tennis courts. 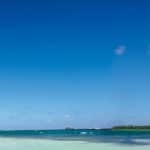 A white-sand beach (with entrance fee), protected by a coral reef and perfect for snorkeling, is a ten-minute walk away. A nature trail around the grounds leads you through a miniature rain forest and over rolling lawns. Quiet surrounding roads are ideal for hilly walks under a canopy of trees. A reading room, the Hummingbird Terrace and its bar complete the picture of a relaxed vacation resort. For more information, pricing, or to reserve your room visit Goblin Hill Villas at San San. Moon San Villa at the Blue Lagoon overlooks the Caribbean Sea and is 300 feet from the Blue Lagoon. It offers daily complimentary breakfast for two, free use of the African Star boat for snorkeling and sightseeing and passes for the Blue Mountain Bicycle tours. Free Wi-Fi connection is available in every room. For more information, pricing, or to reserve your room visit Moon San Villa. 1. I’ll avoid the hurricane season, so I’ll keep away from the Island from June to November. 2. I’ll avoid the busiest months for tourism, so I won’t go to the Island on January, May nor December. With this in mind, I have started to plan my trip to go on April. PD: I didn’t know that Monkey Island really did exist. I learnt that with your post while you commented about Folly Point Lighthouse, which overlooks Monkey Island. And I have continued to research and it’s a really tiny island. As a teenager I played a video game based in the Caribbean called “Monkey Island” by LucasArts. And I was thrilled to discover it’s located in Jamaica. Thank you very much (an additional attraction to visit on my trip)! Great Henry! You will love it and Monkey Island 🙂 Thanks for stopping by! I would go in januar actually, seems to be a very good month, it is cold here, and there is warm, perfect. Also, the environment of Jamaica is beautiful, the beaches, and much more. I saw it once passing by and I was like: this is a place to go. And now reading your post, I will certainly book a trip! Glad you enjoyed Emmanuel. Please let me know if you need any additional information. Thanks for stopping by my Port Antonio Jamaica Travel Guide. Now this is a beautiful place. I’ve always wanted to visit Jamaica. There’s something amazing about this island, the culture, history (even the struggle and civil unrest), that I find interest. Plus, I love Reggae. An I have to try any place that has a restaurant that blends Bob and Alice. Yes it is a beautiful place JB. I am glad you enjoyed reading! Thanks for stopping by! 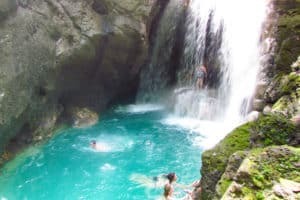 OMG, is this really Jamaica, I love your travel guide articles, and this one is also superb and very very helpful for the people who want to go there, your website is “A MUST” for all travelers and this is my very honest thought. Thank you so so much for sharing yor ideas and helful adises for all the tourists. So glad you enjoyed Sarah! Thanks for stopping by my Port Antonio Jamaica Travel Guide! Wow, you have opened my eyes to Port Antonio, I have been to a few of the Caribbean island but had not even heard of Port Antonio. It looks absolutely gorgeous, it definitely has the feeling of not being a massive tourist island! The five attractions you have featured all look great, I have always wanted to go to a blue lagoon and waterfalls. Great choice of hotels too! I am bookmarking this website for when we are booking our next Caribbean holiday!! Great Dianne! Thanks for stopping by! Hi Biova, you will not need a passport to visit Jamaica. I do not have a partner to help with reservations, but I can do this for you. Just let me know the trip specifications so I can put something together for you. Hi Lea,WOW, such a beautiful place, Port Antonio! I love it!We want to surprise my husband for his birthday in the summer with a trip, and we didn’t know where to go exactly. This is the perfect place for a family trip. I really like the Mocking Bird Hill hotel; I think I am going to reserve way before we travel. 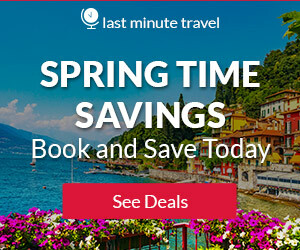 How much time in advance should book to get better deals? Thank you for this excellent post! You know for Port Antonio, 2 to 3 months is find for booking ahead. You husband is going to be very happy 🙂 Please let me know if you have any additional questions. Thanks very much for the detailed travel guide! I love going to beaches very much. I think it feels awesome to just lay down on the beach, and do nothing at all but enjoy the sun!! Waterfalls as well! I love taking photos of waterfalls. They help me experience how great nature is!! Plus, another reason I love visiting these kinds of place, is that they’re excellent diving spots! So is there any diving sites you will suggest in Port Antonio? Appreciate the details you included, they’re pretty much everything I need, if I’m visiting Port Antonio in the future, I definitely will revisit your post! Hi Mark and yes. I would definitely head to Frenchman’s Cove Beach for diving. If you need a dive shop, the best one is Lady G’Diver. Please let me know if you need any additional information. Thanks for the visit. Port Antonio Jamaica Travel Guide has saved me a lot of time for me in researching about Port Antonia Jamaica. This article had everything I needed to know about that place. The weather in that place and the right time to go there. I also learned about all their attractions and the look amazing. I would love to go there one day. This is well written article. Thank you so much for sharing this post with us. You are welcome and I glad you enjoyed reading my Port Antonio Jamaica Travel Guide. Thanks for the visit. I have been researching beach vacations for about a month now. I am thinking that Port Antonio may be just the spot that I am looking for. The Blue Lagoon was maybe the second movie I ever saw at a theater. I was with a date. So, when I saw the name of the Blue Lagoon on your list, I was first awed by the beautiful picture. Then I wondered it it was the same place that the movie with Brooke Shields was in. I am so glad you answered that question for me. It would be cool to be able to see the Blue Lagoon in real life. The photographer in me would enjoy it. That said, I would not pick a travel destination just because it had one place in the movies that stirred up old memories. Your description of Port Antonio as being a tangle of old backstreets, browsing goats and friendly locals is what interested me most. Along with the idea of maybe seeing banana plantations. So, here is my question. Although I would want to stay a couple days in one of the nice hotels, I want to be able to spend much of my time with the locals and the farming community. Here in the United States, there are vacations on “dude ranches” which allow people to experience the cowboy and ranching lifestyle. Are there any types of ways to spend time on a farm or banana plantation in the Port Antonio area? I’ll be sure to check back in a couple days to see if you responded. Thanks in advance. Thanks for your great comments and question. I do believe that you will enjoy Port Antonio. As far as staying on a farm or banana plantation, I don’t know if any per se. There are quite a few great choices on AirBnB which might get you what you are looking for. Thanks for stopping by! I’ll check out the link you provided. Thank you. After a week, or however long it has been, Port Antonio is still my top choice. I like the idea so much that I haven’t even been in the mood to read about other possible beach destinations. Thanks a lot for sharing such an informative article. I have never been to Jamaica but my friend was and I heard only the best things about this place. I would like to go there with my wife and kids but I would like to go there in July, just a question, can I take my pets with me? I have a dog and a cat and it would be great if they can go with us. Hi Daniel and great questions. Yes, you can take your pets with you. Just make sure their vaccinations are up to date and that your dog has had his rabies shots. And they will both have to be on a leash. Thanks for your visit to my Port Antonio Jamaica Travel Guide. Wow! 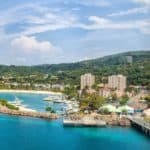 What a great write up for visiting Jamaica. I have always wanted to visit Jamaica, and hope to still some day. I am very much a nature enthusiast– where would you recommend for someone who is looking to really explore, whilst being safe? The video and pictures really complimented the imagination of what these places are like. Thank you so much for putting a lot of work into this- it shows! Glad you enjoyed Ciara! Come back again and visit when you are ready to start planning. 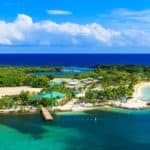 I always have a dream if one day visiting Jamaica and what I have just seeing has proven I have never been wrong it’s place worthy my visit and a vacation will do me a great good than harm those beautiful places can only be found on the beutiful Jamaica. Jamaica is beautiful Charles, that is for sure. As far as beach travel goes, it is probably one of my top beach destinations. Thanks for visiting beach travel destinations. How long you suggest i should spend in Port Antonio to comfortably enjoy all its attractions? I read the article and i cant make up my mind on which attraction to visit first they all seem beyond beautiful places to see. Definitely two weeks if you can Vera! Think of it this way, you will have two days of travel – getting there and getting home. So with just a week, then you are down to 5 days. I like to enjoy the attractions, as well as some down days to just relax at the beach. For me it takes two weeks for this 🙂 Hope this helps! Port Antonio looks like a little slice of paradise! The beaches look terrific and it seems like the type of place that I would like. A bit of history and quiet with fewer crowds than in more well known places. I’m glad that you included some of the restaurants’ fare as well. It was good to see a restaurant that serves conch. I like cracked conch and conch fritters. The pictures and the idea of a warm vacation make me want to go. And I am not a beach person except maybe a nice restaurant overlooking the sand and water or possibly a laid-back beach bar. That way I can say I’ve been to the beach. Frenchman’s Cove and Folly Ruins beaches do not look very big. I wonder if the could be quickly overrun by beachgoers. I think you will find that these beaches will not be “overrun” and you can enjoy your beach drink with your toes in the sand 🙂 Thanks for the visit Glen. 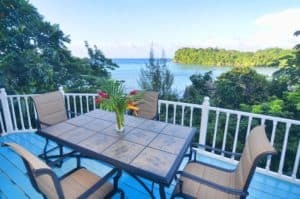 Every venue you have reviewed in Port Antonio I simply want to visit now! Your descriptive content and super enhanced images makes me feel like I am already there! Anyone who is thinking of visiting Jamaica this year simply has to visit port Antonio! Are there excursions from local hotels to these venues or are they easily acccessible ? Hi Darren and thank you for visiting my Port Antonio Jamaica Travel Guide. Yes, you can book tours to the attractions. You can also rent a car if you like and drive to them. There are lots of possibilities and they are easily accessible. just last night my wife and I started talking about our next vacation. And wouldnt you know it Jamaica came up in the conversation. We are looking to go in about a year from now. Thats kind of how we take our vacations. We go every two years with planning being about a year ahead. Your review really has me intrigued into looking a bit more into Jamaica. I have a couple quick questions. 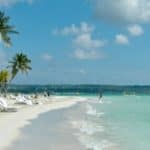 Is Jamaica okay for kids and are there all inclusive vacation packages. I look forward to hearing your answer. Hi Dale, and you and your family will love Jamaica. Yes, Jamaica is family friendly. You can also check out some of the other Jamaican locations I have reviewed here. 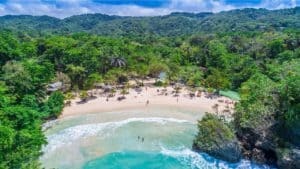 Here are the best all-inclusives in Jamaica: The Spa Retreat Boutique Hotel (Negril), Trident Hotel (Port Antonio), Moon Palace (Ocho Rios), Sandals All-Inclusive Montego Bay, and Grand Lido Negril. Please let me know if you need any additional information. I really like how you listed Jamaica specific website links on your page. I always prefer to work with websites that specialize in a specific location. Some many other sites “specialize” in 20 different countries, but offer watered down advice. I can tell you have some personal experience in Jamaica. 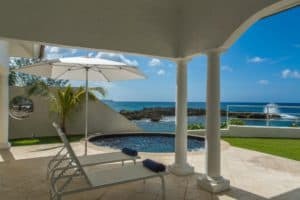 I’m curious, what’s been your experience with Air B&B in Jamaica? I would image it would be difficult the find a place. I’m sure everything is booked up all year. Have you ever stayed in one in Jamaica? Hi James and thanks for stopping by. I have not stayed at an Air B&B in Jamaica. They are out there, but I don’t have any experience on how fast they book up. I would imagine if you book far enough in advance, you would be okay.